Housed in attractive die cast aluminum housing, this powerful 850W juice extractor will add beauty and function. The unit's extra large 3" feed tube makes it easy to process whole fruits and vegetables, without pre-cutting or peeling. Features stainless steel elements and dishwasher safe parts for quick cleanup. Accessories include: 0.8 liters juice jug with froth separator, cleaning brush and pulp container. Automatic ejection into pulp container. MSRP $129 Based on the Manufacturer's Suggested Retail Price, this juicer is priced about average. 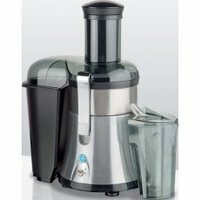 Motor Warranty 1 Year When compared to other juicers, this appliance has a shorter than average limited motor warranty. The motor warranty is a good indicator of motor durability. Star Rating 4.5 User reviews, ratings, and feedback indicates that this juicer is rated higher than average by 2 users and ranks in the top 19% of juicers.